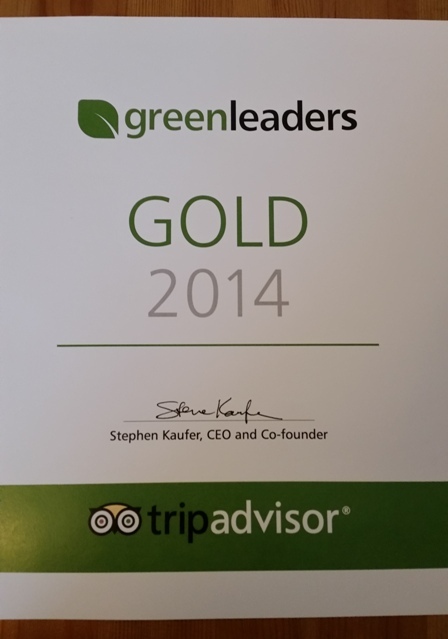 Our Trip Advisor Green Leaders Gold Award Certificate. 6/6 Annies. What lovely and friendly people at AnnÃ­es, rooms was very clean and tidyied every day, a big thankyou to Annies for making our week. 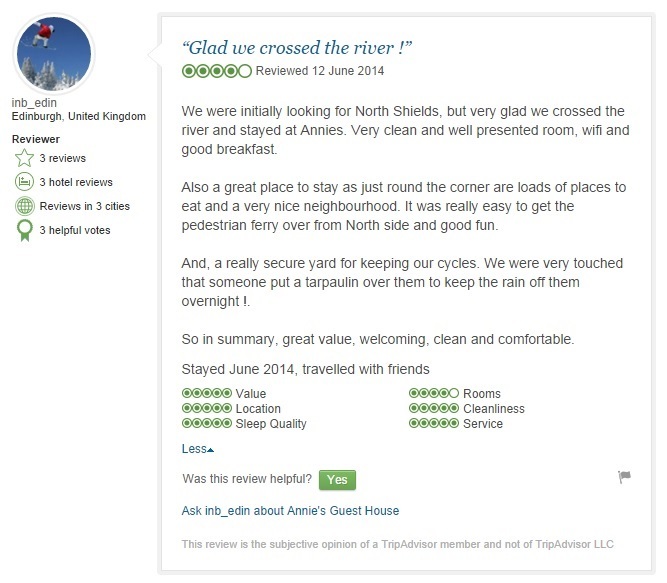 - Online review after an eight night stay with us. 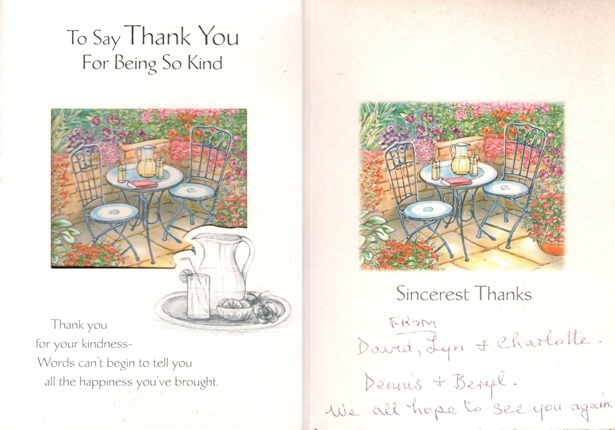 - Thank you card from a couple who stayed with us on their second honeymoon. 8.3/10. Very good. Comfortable clean beds, good selection at breakfast with friendly cook eager to please. Location next to the park was good as were bus stops close by. 9.6/10. Exceptional. Warm friendly welcome. Clean comfortable bed, tea coffee etc, hairdryer, ironing facilities, plenty coat hangers. TV with subtitles (a plus) many big hotels we've visited don't have these. Lovely full English breakfast cooked by lovely Joan. Excellent location for seafront, town, bus, Metro. 6/6. Annies. 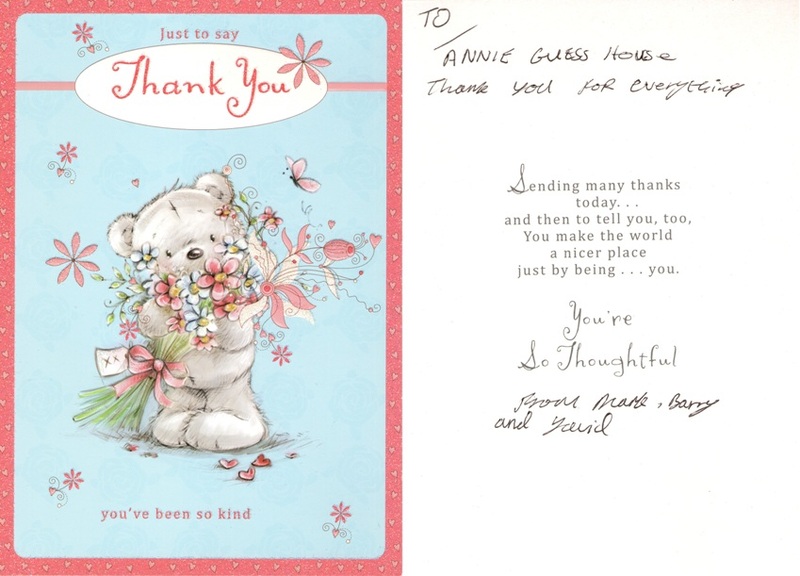 What lovely and friendly people at Annies, rooms was very clean and tidied every day, a big thankyou to Annies for making our week. 9.2/10. Superb. Very friendly, free parking on the road outside, free Wi-Fi, and a lovely breakfast. 10/10. Exceptional. Friendly caring staff. 4/5. Lovely comfortable stay. Lovely homely little guest house in central South Shields. We arrived early but Annie (I'm guessing it was Annie?!) allowed us to check in early as we had a wedding to get ready for. Room was very clean double bed plus single large window that fully opened up which was brilliant as it was red hot. Large telly. Bedding clean. Downside tiny shower cubicle and I mean tiny! Bathroom very small. (Although there is a huge communal bathroom with large shower on same landing if needed only noticed that later!) Good nights sleep bed was very comfy. Cooked breakfast the following morning was faultless just what I expected good quality cooking. All in all a brilliant nights stay at a good price. We'd be back. Thankyou. Room Tip If wanting to arrive early let Annie know beforehand. 7.1/10. Good. Access via code to B&B as well as room. Good breakfast. Comfortable bed. 8.8/10. Fabulous. Good breakfast, comfortable bed, helpful personnel. 10/10. Exceptional. Exceptional warmship shown and lovely family b&b. 9.3/10. Superb. Friendly staff and homey atmosphere. Beach & Metro nearby! 10/10. Exceptional. Breakfast served over three hours so you can get up early or lie in. Lots of choice and all freshly made. Very clean throughout. Free wifi was good also. Plenty of space to park out front. 7.5/10. Good. Excellent locality, for town centre, and beach front. - Thank you card from a family who stayed seven nights in our standard twin room and one of our standard single bedrooms - their second week long stay with us this year. 7.5/10. Good. The self entry doors using a code are good. You can come and go at anytime and were helpful as I arrived late ie after 9pm. Breakfast was nice. Staff were friendly and communication was good throughout my stay. Shower/bathroom/toilet were shared with my room but nice and clean as was the place in general. 9.2/10. Exceptional. Super friendly welcome from Linda, and a splendid fry up the next morning. WiFi worked fine & the door code access was easy to master. Communal toilet & shower facilities were clean/pleasant. 10/10. Exceptional. Fabulous hosts, very clean, superb freshly cooked breakfast. 10/10. Exceptional. Wifi signal was strong and quick even on top floor. Huge choice for breakfast that was freshly made. Exceptionally clean throughout. 6.3/10. Pleasant. Location, short walk to the beach Annie was friendly and welcoming. 4/5. Glad we crossed the river! We were initially looking for North Shields, but very glad we crossed the river and stayed at Annies. Very clean and well presented room, wifi and good breakfast. Also a great place to stay as just round the corner are loads of places to eat and a very nice neighbourhood. It was really easy to get the pedestrian ferry over from North side and good fun. And, a really secure yard for keeping our cycles. We were very touched that someone put a tarpaulin over them to keep the rain off them overnight! So in summary, great value, welcoming, clean and comfortable. 10/10. Exceptional. Spotlessly clean throughout. Ample parking outside hotel on quiet residential street. Five minutes walk to around 20 restaurants/pubs that were very reasonably priced. 24h supermarket was 10 minutes walk. Excellent breakfast choice - 9 varieties of free-flow cereal, tea and coffee options. Excellent value for money. Would certainly recommend. 6.7/10. Pleasant. Friendly welcome and great breakfast choice. 7.5/10. Good. Very friendly, very helpful with local restaurants and area locations and good help on local transport to concert. 5/5. B & B. 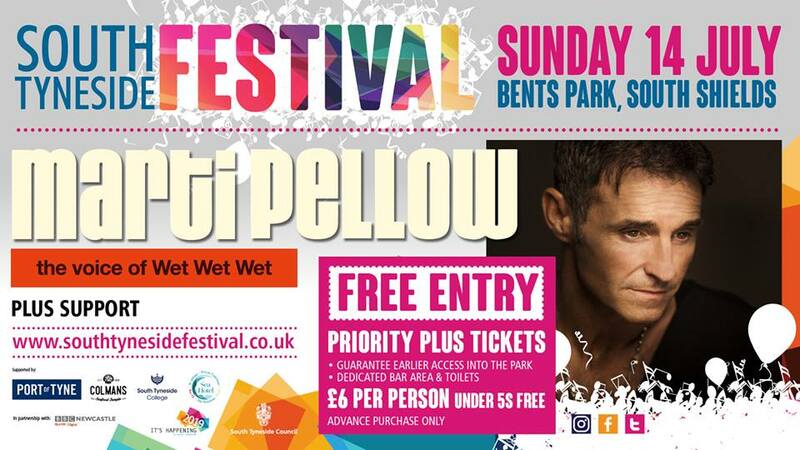 We booked this on Monday morning (26th May) as a last minute decision. We found the address fairly easily, though being a holiday, parking was a bit of an issue. It's a short walk down to the main beach front and the other way is the town. Our room slept three very comfortably. The ensuite was small but adequate. It was lovely and clean throughout. The morning breakfast had a wide choice and cooked on request. Well worth the last minute booking. Room Tip We asked for a quiet room and were at the back of the property which was very nice though didn't hear any noise even from other guests. 9.6/10. Exceptional. Very close to the front. Great food. Rooms very comfortable. Nice and quiet even though on busy road. 9.2/10. Superb. The location is great for visitors with children... stunning local park, fair and beach. The beds were extremely comfortable and facilities spotless. The coded door locks were great instead of traditional key entry. 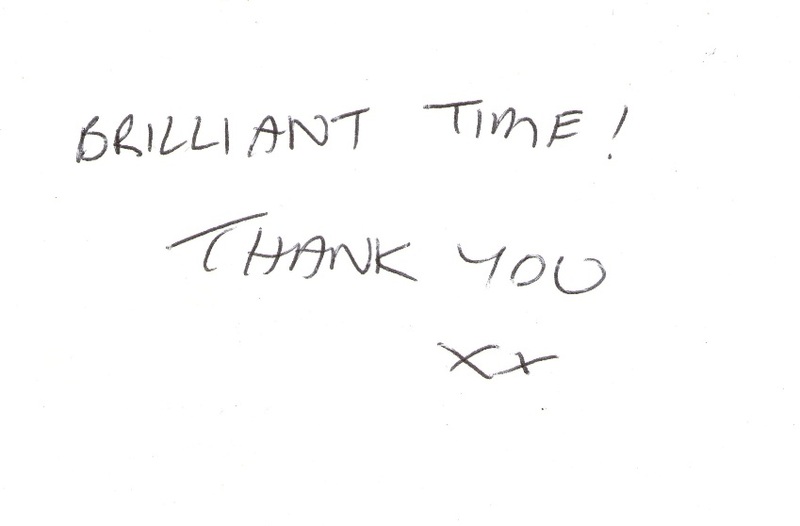 - Thank you card from a couple who stayed with us for two nights in one of our en suite double bedrooms. 5/5. Tremendous Value. I am posting this review on behalf of my friends with their consent. They came back to the North East to visit us and stayed here for two nights. They are full of praise for the welcome and facilities offered and would gladly stay here again. Nothing was a problem, and it is five minutes walk to the beach and five minutes to Curry mile. My friends have said this is a gem and will certainly recommend to friends in the West Midlands. We were University students 1969. Room Tip All rooms are value for money. 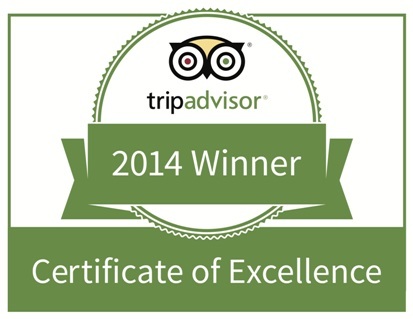 TripAdvisor Certificate Of Excellence 2014. 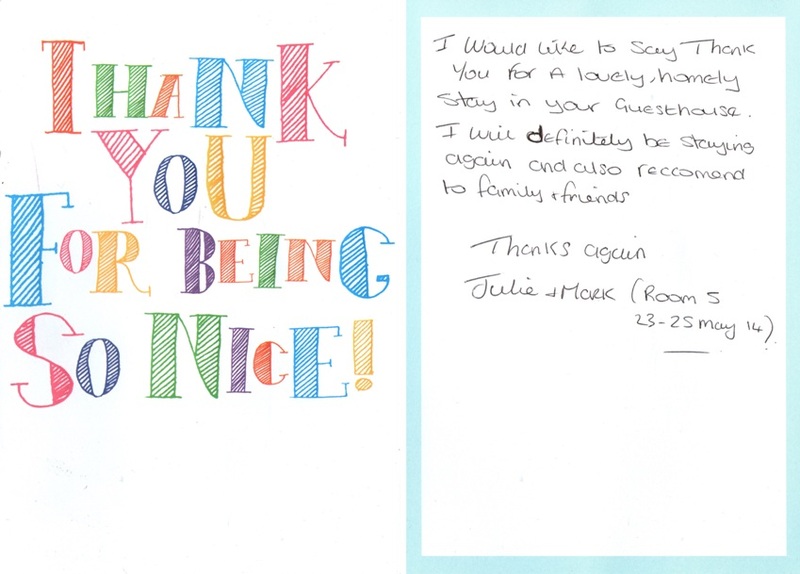 - Thank you card from a family of five who stayed with us. Friendly and helpful staff. Informative welcome. Breakfast cooked to order. Having access to fridge, microwave and dining room in the evening. For the price, this is difficult to fault. South Shields is a great place for a budget short break..
6/6. Friendly, comfortable, spotless. Stayed 2 nights in standard (not ensuite) single room. Organising an early check in proved no trouble at all, very efficient. Room was quite small but adequate and fully equipped (tv, iron, board, tea, coffee, kettle). Room and wc and shower, bathroom absolutely spotless. Excellent breakfast. Outstanding value, will definitely use again next visit. 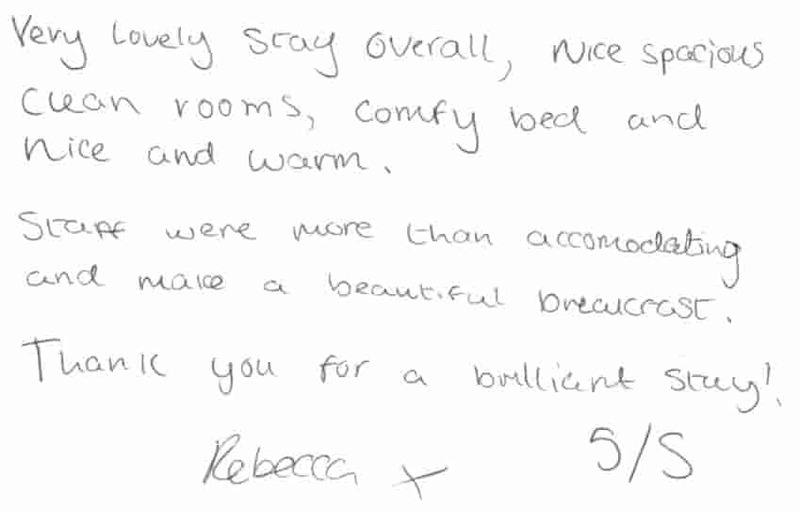 - Guest feedback after a four night stay with us attending a course at AIS Training. Very little to do at night time after 7pm with my ten year old daughter over Easter weekend in South Shields, Annie's guest house was lovely and clean and served a very nice breakfast. Nice cooked breakfast in the morning. Bath in the evening. 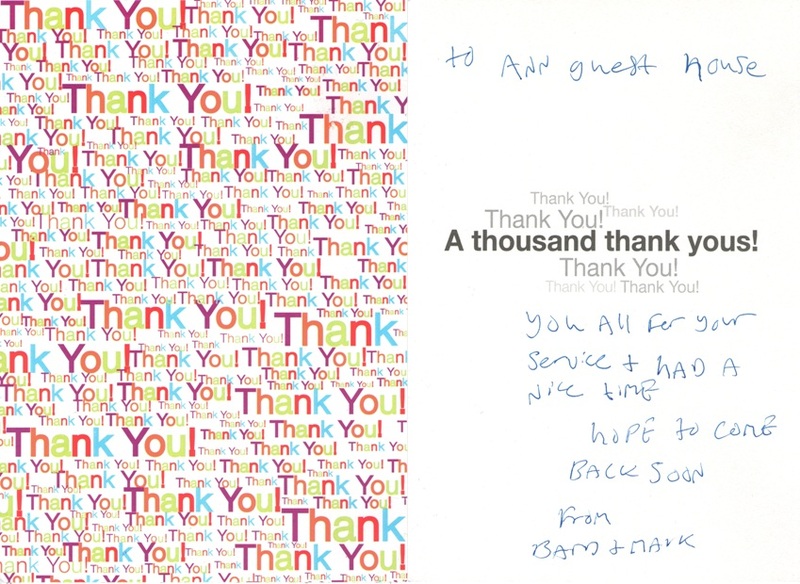 - Feedback from guests who stayed with us whilst training at Maersk Training Newcastle. I would definitely stay there again. Thank you for our stay it was lovely and had everything you need. This is the second time we have stayed at Annie's Guest house and we love it. Great location, excellent facilities and lovely people too. - Nothing it was a great place to stay. 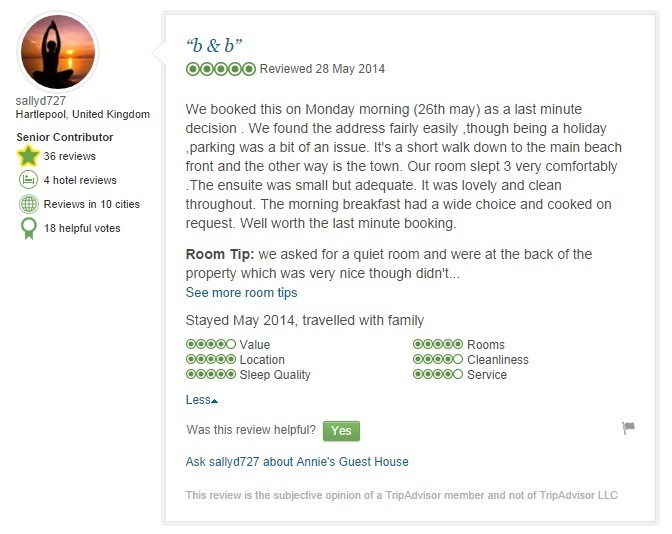 5* Brilliant stay, nice people! I'm from Milton Keynes and booked this b&b when visiting a mate in South Shields, but I booked for two adults so my mate could also stay on some nights, and it was a brilliant place! We got a three bed room, memory foam mattresses, freeview tv, all what you need when staying for five nights! A brilliant place to stay. Very nice staff, when walking downstairs the cleaners will ask how you're doing. The lady who does breakfast every morning is very friendly, always starts up a conversation and recommending places to go. And the lady who shows you around during check in, very nice as well! Not on the main road so its nice and quiet, but is literally a five minute walk away from everything, the beach, main shops, metro, main bus locations. Never a far walk! Overall a brilliant stay, and will be using this b&b everytime I come up! 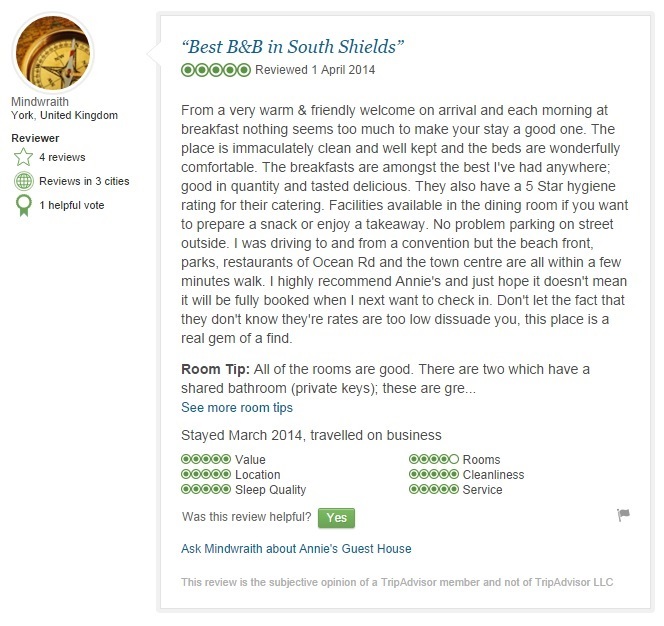 5* Best B&B in South Shields. From a very warm & friendly welcome on arrival and each morning at breakfast nothing seems too much to make your stay a good one. The place is immaculately clean and well kept and the beds are wonderfully comfortable. The breakfasts are amongst the best I've had anywhere; good in quantity and tasted delicious. They also have a five star hygiene rating for their catering. Facilities available in the dining room if you want to prepare a snack or enjoy a takeaway. No problem parking on street outside. I was driving to and from a convention but the beach front, parks, restaurants of Ocean Road and the town centre are all within a few minutes walk. I highly recommend Annie's and just hope it doesn't mean it will be fully booked when I next want to check in. Don't let the fact that they don't know they're rates are too low dissuade you, this place is a real gem of a find. Room Tip All of the rooms are good. There are two which have a shared bathroom (private keys), these are great value and the bathroom is impressive huge roll top bath (with a family of plastic ducks!) and a big corner shower. + Annie's guest house is in a close location to the sea, it is very clean and comfortable, the staff are extremely helpful and friendly and there is a full cooked breakfast. All together a very pleasant experience. - There was nothing I did not like. - Thank you card from guests who stayed with us for a week. 10/10. Exceptional. + Fresh food and a smile every morning. - That I had to depart! 5/5. Good, Fancy, and Cheap. 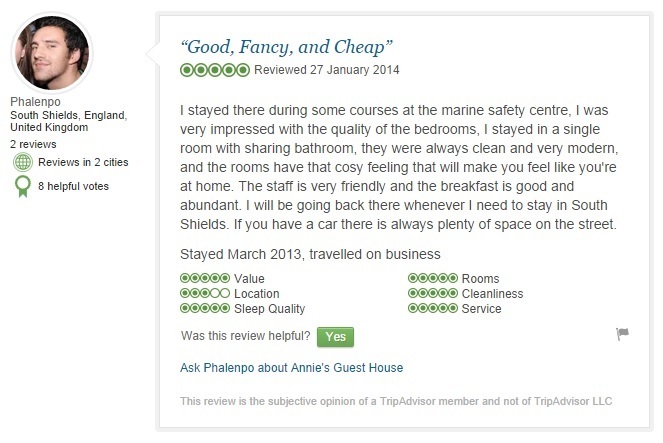 I stayed there during some courses at the Marine Safety Centre, I was very impressed with the quality of the bedrooms, I stayed in a single room with sharing bathroom, they were always clean and very modern, and the rooms have that cosy feeling that will make you feel like you're at home. The staff is very friendly and the breakfast is good and abundant. I will be going back there whenever I need to stay in South Shields. If you have a car there is always plenty of space on the street. 8.3/10. Very good. Kleine, einfache, saubere, preiswerte unterkunft mit sehr freundlichem personal. Etwas weg vom zentrum von Newcastle, aber sehr gut mit der Metro erreichbar.